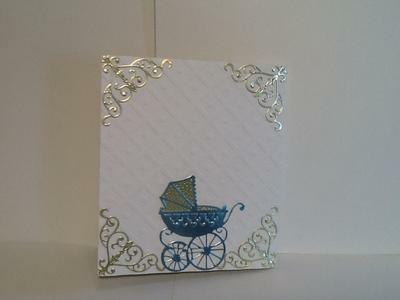 This is a card I made for a baby shower. Since it was for the couples 1st, I wanted to make it extra special. My niece and nephew were having a boy, and already named him Nicholas. 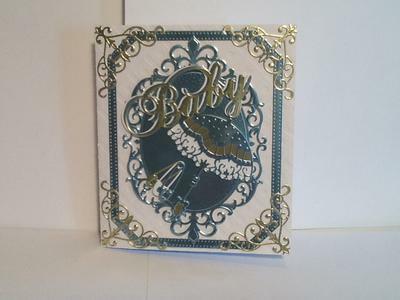 I used foil paper from Create and Craft, white paper from Bazzill, and baby dies from Tattered lace. The sentiments were composed on my Zink Happy and printed on two inch sticker tape that I matted on paper. This was the first time I made a box envelope, using the We R Memory keepers envelope maker. 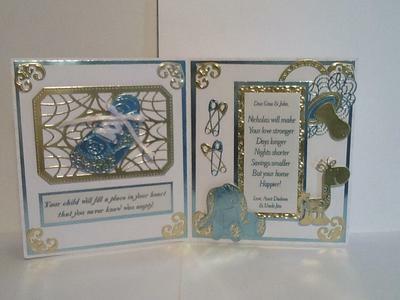 I did use a Spellbinders die on the front of the card, as an oval frame for the umbrella. 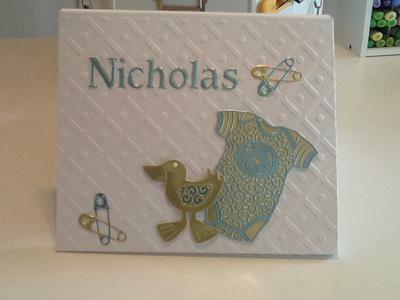 This is such a pretty card and I am sure that the new parents will have been delighted with it. You have made everything work so well together and how nice to know what the baby is and have the name chosen before his birth. Your card had to do special to the new parents! I just spent a couple of months looking at baby cards, searching for ideas for the baby girl my sister is due to have in about a month. I've made the card now, but I am certain your card is the cutest one I have come across, by far! What a lovely card. I'm sure the prospective parents will be very pleased to receive it. Very pretty card! Well done! thank you so much for sharing.